On the day after Christmas this year, I attended a White Elephant/Ugly Sweater party with a great group of likeminded history nerds. The hottest items in the exchange were, fittingly, Detroit history books (and booze). Believe it or not, I’m rather low on ugly sweaters, so I wore the next best thing: a circa 1980s blue sweatshirt imprinted with a martini glass and the words “Abicks Bar, 3500 Gilbert, Detroit”. It’s not especially ugly. In fact, it’s one of my most prized possessions, and stands as evidence of why, after over a year of occasionally working there, I haven’t been able to write about Abick’s until now. If you want to know the history of the bar (and it is a remarkable one), read this article I wrote for Model D last year. Today’s post is going to be a bit different than the usual history + promotion. There’s a very good reason for this. Photo credit Cybelle Codish for Hour Detroit. Every once in a while, you enter a place that somehow instantly strikes you to the heart. It wraps you up in its warm embrace and renders the outside world trivial and insignificant. Cash only, and no bitching about it. Even better: when you sit down at the bar, pile the cash you’re ready to spend on the bar top. Buy a round for whoever’s propped up next to you (it’ll likely be Chavo or Dan or Don and Diane or Andy and Maria). 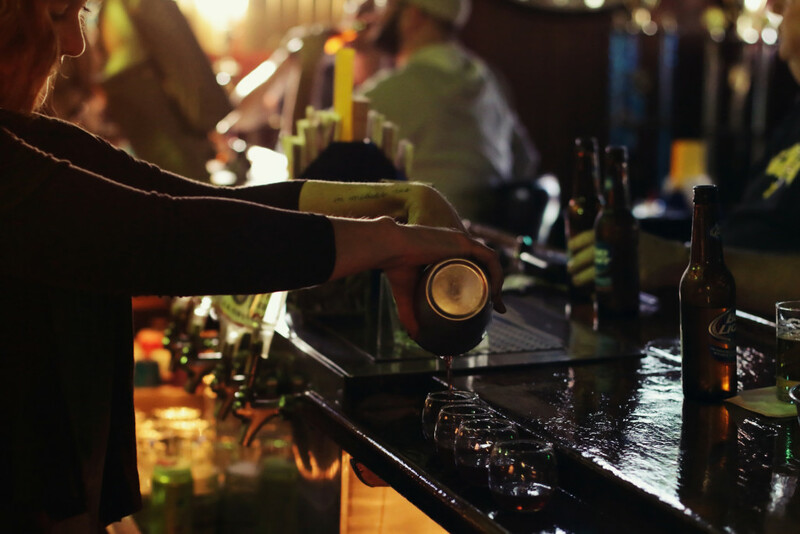 The bartender will take what he/she needs from your pile of cash, pop it in the centenarian cash register, and give you your change. Simple as that. Repeat as often as desired. Be prepared for lively debate on today’s issues from folks who’ve lived in the neighborhood for (probably) a whole lot longer than you, and who have seen a whole lot more than you have, and who probably have very different opinions from yours. Engage or don’t engage, but consider yourself forewarned. 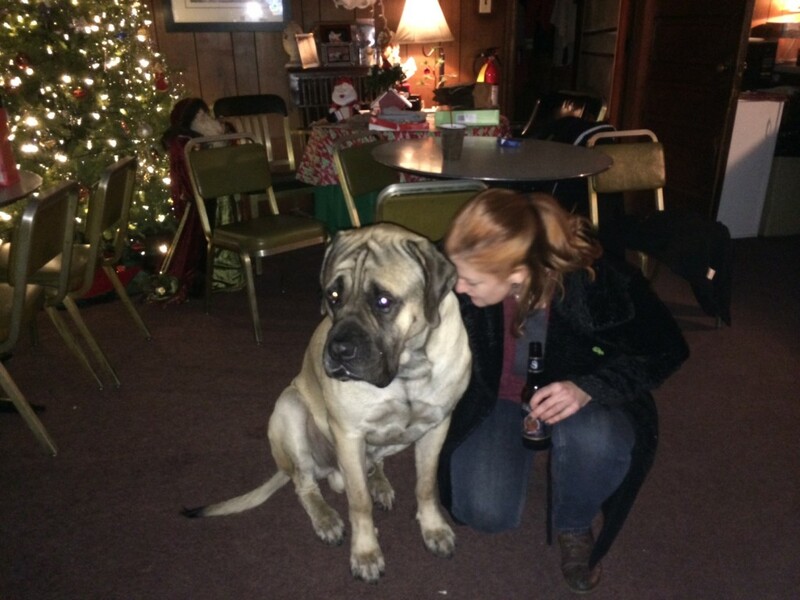 Understand that, yes, Shadow (the current bar dog, an English Mastiff) is an adorable dog and you really do want to be his best friend. Also understand that at heart, he’s a tremendous baby, and that it will take patience and REPEAT VISITS to make him your friend. Once that friendship is earned, expect lots of hand-holding and also lots of slobber. This photo was possible after more than a year’s repeated visits, and me working there for several months. 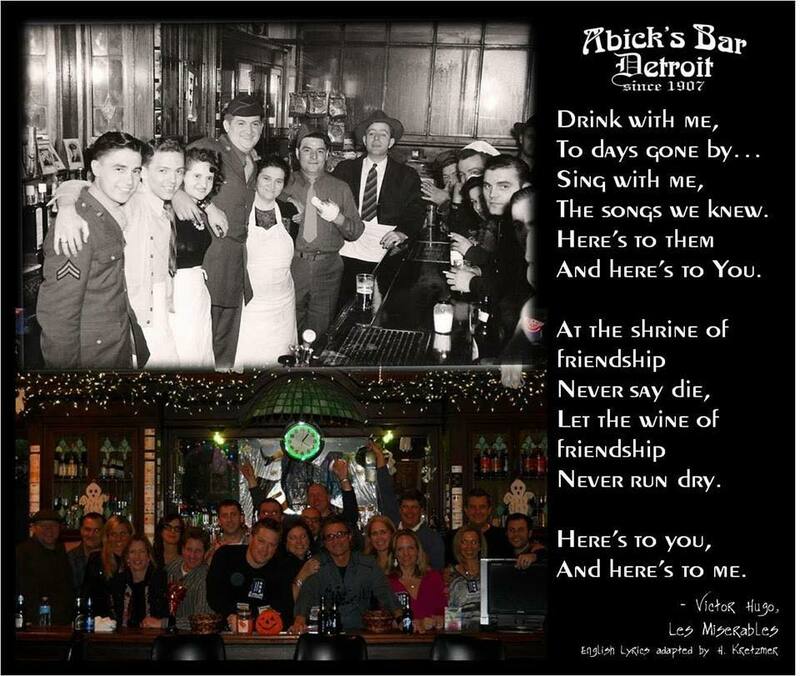 So, yeah, Abick’s is a family bar, through and through. You know the funny thing about families and home, that thing that Robert Frost wrote? “Home is the place where, when you have to go there, they have to take you in”? It’s kind of like that. 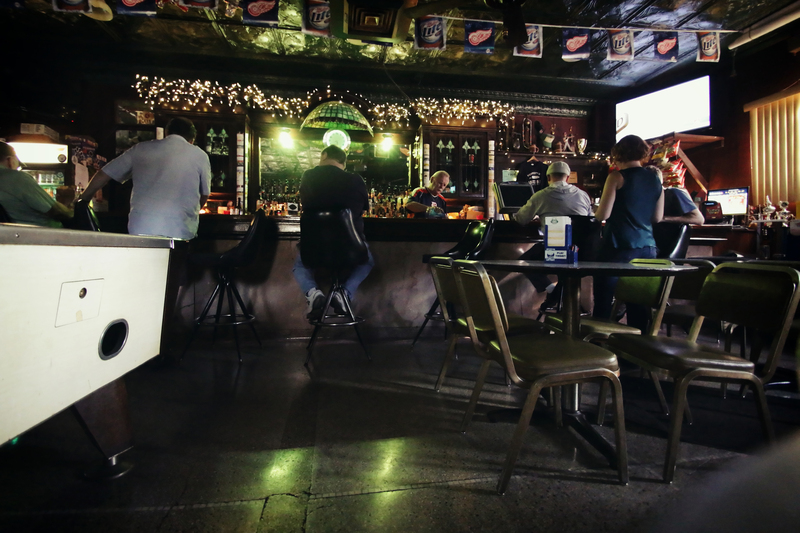 The Abick’s cast of characters is a diverse group bound by one building, one bar varnished by generations of elbows and arguments and Polish feasts. And here’s where it gets tough. Because, last year, the cornerstone of that bar was lost. 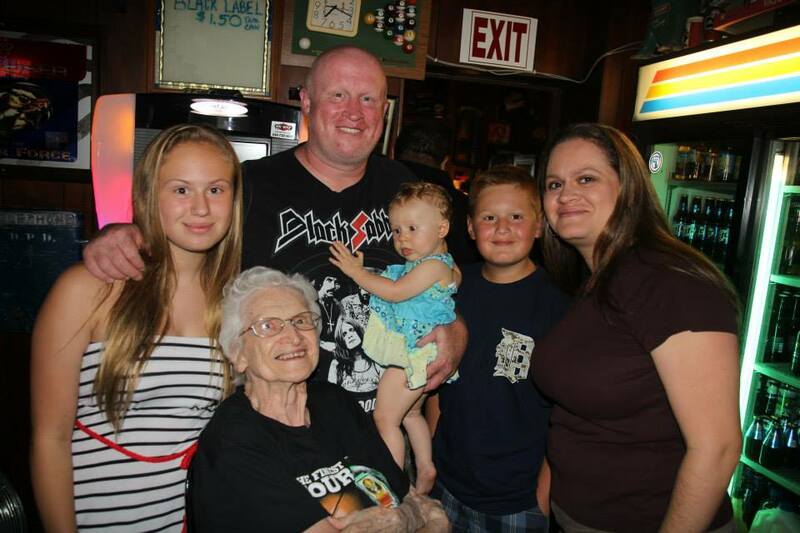 For pretty much all of her 91 years, Manya Soviak held court on the corner stool by the back room, welcoming friends old and new with a hug and a genuine smile. I could write pages on her warmth and strength, her steely nerve in the face of troubled neighborhood kids and family deaths and hardships galore, her quiet grace and queenly authority. Manya WAS Abick’s, for the entire lifespan of many people. When she died last year, on December 26th, the community was hit hard. Not just the regulars–no, that’s too formal, let’s call it what it is, the bar family–but also the neighborhood for whom she’d done so much. Manya was the matriarch of the Abick/Soviak family, of the bar family, and of her church. So many people were devastated. Moving on from that was painful and fraught with tension. If you’re lucky, you’ve never seen what happens when the strong figurehead of a family leaves a gaping hole after passing away. I’m guessing, though, that you’re familiar with the dynamics. Grief, confusion, and an overwhelming sense of loss battle with conflict about who’s to take the reins and in what direction the ship should steer. Filling Manya’s size 5 shoes wasn’t an option. The family cried, and cried some more, and threw a monster of a wake (at the bar, of course), and bickered. A lot. What should be done next? Should big changes be made? Should everything stay exactly as it was, as Manya liked it, as a shrine to her memory? Working at the bar for the first 6 months after we lost Manya was some of the hardest bar work I’ve ever done. Not because of heavy lifting or difficult customers or busy nights (although there were a few of those), but because you could just feel the pain in the floorboards and beams of the building, the loss and confusion in every joint and fixture. Loss is hard, and change is harder. Stolen from their Facebook page, probably posted by Kit Lindamood, social media guru. But, ever so slowly, spirits lifted. As the summer sun poured through the front windows onto the squinting patrons, I started to sense a renewed vigor. The Abick’s family was starting to learn how to be a family without Manya there 24/7. There was more laughter. There was less bickering. There was more teasing. We started planning more charity events and fundraisers and parties, brainstorming new ways to carry on the Abick’s tradition of hospitality. Kit invented a new shot to complement the traditional Jezynowka (Polish blackberry brandy) always served at Abick’s to regulars and newcomers. The Polish Motor Oil tastes (to me) at once utterly foul and soothingly familiar, simultaneously of grandma’s cough remedy and wild college nights. Jezy pouring, photo courtesy Cybelle Codish for Hour Detroit. And this is as good a way as any to wrap up my reminiscences of so many days and nights at Abick’s. We’re keeping the Old Detroit traditions that mean so much: the tin ceilings; the tiny plastic cups to signify a round bought; the impromptu feasts and the extravagant charity auctions. But we’re moving forward in the best way we know how in a world without Manya, gathering in a little bit from the new customers and trends in New Detroit. And we’ve even thrown a craft beer or two into the mix. Oh, and that sweatshirt I wore to the Ugly Sweater party? Eric gave it to me a few weeks previous, and I cried like a baby. It belonged to Manya. It still smelled like her, of soap and lavender and just a hint of blackberry brandy. All of my love to Eric, Debbie, Kit, Greg and Jake, and Shadow. And to Chavo and the rest of the Abick’s bar family that shared so many nights of laughter and Jeopardy watching. I knew Monya since 1964 when I atteended Chaedsey High School with her daughter Marie. Then I got to meet Monya. After school I became a beauticin and when I moved back to Southwest became re aquainted witth Monya and cut her hair for years. Many a good time with her and at Abicks. My twins also attended Logan Elementary with that little stink pot Eric. You can tell him I called him that. Love that boy. Monya had the unique ability to let you feel like the most important person and truly mean it. She certainally can be labeled one of the GREATEST of her generation.